“Who wants to manage the accounts payable clerks, and the billings?” Thus spoke practice management consultant Peter Zeughauser as he predicted that large law firms eventually will outsource most of their back office functions. The quote appeared in a Wall Street Journal article discussing the many ways large firms are trying to reduce their back office costs. I think Peter is correct. [i] Outsourcing makes business sense – it reduces costs, increases efficiency and frees up management time for more important things. Not just for large firms, it makes sense for small and midsize firms, too. Let me explain. The purpose of this memo is to make the business case for small/midsize firms outsourcing their accounting and billing functions to an experienced, qualified outsourcing service provider (“OSP”) – someone like 4L Law Firm Services LLC (“4L”). This is the third of three memos inspired an article appearing in the Wall Street Journal article on October 7. The others: WSJ—Big Firms Wring Costs from Back Office Tasks and Outsourcing—How it Works in Theory. 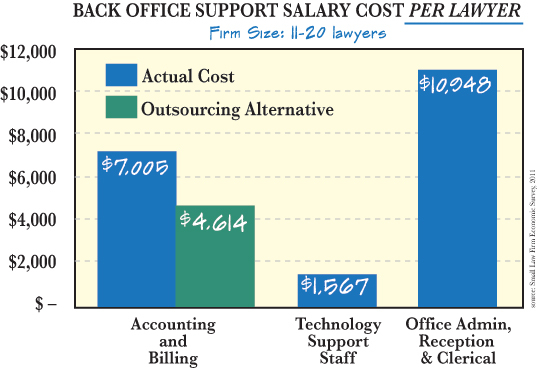 Is it even Possible to Outsource a Law Firm’s Accounting & Billing? Before making the business case, let’s first discuss whether outsourcing is even possible? The answer is “yes.” Advances in Internet connectivity and desktop virtualization make outsourcing not only possible, but practical for small and midsize firms. With today’s technology, a law firm’s back office no longer needs to be located in the same building or even same city as the firm’s lawyers. Big firms discovered this long ago and resisted duplicating accounting staff in every office. The same technology which permits big firms to centralize their accounting enables small and midsize firms to outsource. Regardless of where the software resides, back office and front office personnel in different locations can utilize the same applications. This allows billing and general ledger accounting tasks to be assigned to individuals in one city and for lawyers in another to enter time, initiate disbursements (with the checks printing to any designated printer in the lawyers’ office) and have real-time online access to a myriad of actionable financial data to manage their practice, their client work and the firm. The primary promise of outsourcing is quality back office services at a lower cost than the law firm can provide with internal resources. Quality service and lower cost are made possible through a combination of economies of scale and process improvement. Because it services multiple firms, 4L handles a higher volume of accounting and billing transactions each month. With this greater volume, 4L is able to leverage its accounting workforce more efficiently than any single law firm with lower volume could hope to accomplish on its own. In addition, because the accounting and billing operations constitute 4L’s front office, 4L has invested in superior accounting software – from OrionLaw Management Systems, Inc. – and assembled an experienced law firm accounting staff capable of handling the workflow more efficiently and productively than any single firm could duplicate with internal resources. Through a combination of higher volume, improved technology, experienced talent and process improvement, 4L provides the accounting and billing services to law firms at lower cost and passes along significant savings to its client law firms. Using the Survey census data, I applied 4L’s service fee pricing model to the participating firms. The outsourcing option would cost those firms an average of $4,614 per lawyer annually[iii] – as compared to $7,005. The savings is $2,391 per-lawyer or 34% annually. · frees up firm leadership time to focus on other practice management challenges. Law firms who work with 4L never have to worry about capital expenditures for software upgrades or hardware purchases or maintenance. 4L provides the Orion accounting software via the Cloud where each firm’s data resides on a separate private virtual server. The software and hardware is provided and maintained by 4L without cost to the law firm. Use of the Orion accounting software also makes the law firm’s front office more efficient. There are numerous ways to enter billable time, to lookup client-matter numbers and task codes, and make online inquiries of key financial data such as bank balances, aging of accounts receivable and client status as to last billing, last payment and other information required to manage the firm. Working with 4L provides a higher degree of internal accounting controls than smaller firms generally implement. The 4L staff performs monthly bank reconciliations on all firm and trust accounts and balances the detailed monthly accounting summaries to the general ledger accounts to ensure accuracy of the numbers. Outsourcing also improves existing internal procedures. 4L works with its law firm clients to implement the best practices to streamline billing and collection processing. We recommended changes to billing procedures at one firm which increased their cash flow by nearly $140,000 this year. With another firm, we identified and corrected flaws in produces used to collect documentation needed to bill client advances which increased billing and reduced expenses by more than $150,000. · Engaging in activities needed to attract future clients to the firm. Outsourcing makes sense because it reduces costs, improves efficiency and lets management focus on core business issues. It just makes good business sense to outsource – regardless of the size of your law firm. [i] I decided to go with the first name reference here because it lets me tell the following story. I’ve met Peter on a couple occasions. The first time was about 10 years ago in Chicago. We were both presenting at the same conference and all the speakers had dinner together the night before. All I recall about that dinner is there was good wine (French, naturally) and good conversation with Peter regaling stories about his service as a hockey goal judge for Anaheim Ducks’ home games. [ii] Small Firm Economic Survey, 2011 edition, published by ALM and The National Law Journal. [iii] It is important to note the projected annual fee per-lawyer includes the cost of the Orion accounting software which 4L provides, without fee to its client law firms. If you want to reduce cost and improve regulatory compliance than it is mandatory to review your accounting operational model. For operational effectiveness you should consider about accounting outsourcing. Ayers-Outsourcing have lots of key benefits like simplification and standardization of accounting process, cost saving, accuracy and timeliness. You can focus on your core business activity which is main motive of any business. Well I too agree with the point that if one wants reduce the cost and want to improve than he should keep an eye on accounting operational model. Moreover I learned and earned lot of information from here today. It is not so expensive I suppose. But you know it is better to work with this outsource app development https://qubit-labs.com/outsource-app-development-introduction/ company. I know it as a big professionals. I think quality is a first question in outsource.